A few months back, I had heard that there had been a cataclysm in Azeroth. All of the lands and continents of the game had been changed. Realizing that this might be a great time to visit at a discounted rate, I made sure to keep my eyes open for travel deals. No sooner had I started my search, when an e-mail arrived in my inbox with this subject line: “Bryan – Try World of Warcraft: Cataclysm FREE for 10 Days.” 10 whole days of vacationing in a new land, for free? How could I not pounce on this offer? A game client download and a few patches later, I found myself venturing once more in the lands of Azeroth. A giant lurks in the mist. Blizzard wasn’t joking when they said that things had changed. Right away I noticed the two new races featured in the game, the Worgen and the Goblins. So I decided to choose a new race. The thought of being a werewolf was too amazing to pass up, so I quickly created a Worgen mage by the name of Ruford. Ruford and I rode around the Worgen starting area, slowly learning about the Worgen infestation and how the great cataclysm occurred. Ah Gilneas, World of Warcraft at its most refined. My adventures with Ruford lasted until level 9. It was then that I decided that enough was enough. 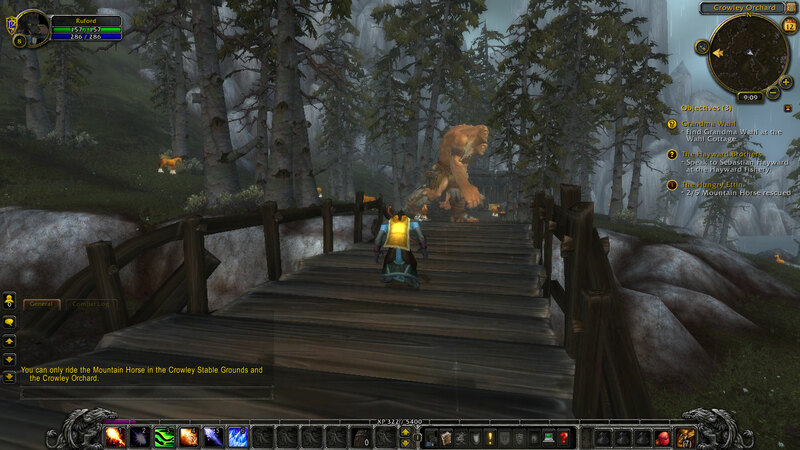 Though Cataclysm represents a fantastic upgrade to the World of Warcraft experience, the game is still the same. Frustrated, I quit playing. 10 days later I find myself wanting to play again…but alas, it is not to be. Farewell new content!